(PhysOrg.com) -- Which come first, the supermassive black holes that frantically devour matter or the enormous galaxies where they reside? A brand new scenario has emerged from a recent set of outstanding observations of a black hole without a home: black holes may be “building” their own host galaxy. This could be the long-sought missing link to understanding why the masses of black holes are larger in galaxies that contain more stars. "The 'chicken and egg' question of whether a galaxy or its black hole comes first is one of the most debated subjects in astrophysics today," says lead author David Elbaz. "Our study suggests that supermassive black holes can trigger the formation of stars, thus 'building' their own host galaxies. This link could also explain why galaxies hosting larger black holes have more stars." To reach such an extraordinary conclusion, the team of astronomers conducted extensive observations of a peculiar object, the nearby quasar HE0450-2958, which is the only one for which a host galaxy has not yet been detected. HE0450-2958 is located some 5 billion light-years away. 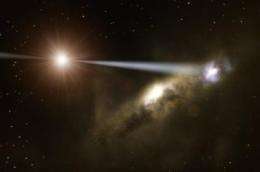 Until now, it was speculated that the quasar's host galaxy was hidden behind large amounts of dust, and so the astronomers used a mid-infrared instrument on ESO's Very Large Telescope for the observations. At such wavelengths, dust clouds shine very brightly, and are readily detected. "Observing at these wavelengths would allow us to trace dust that might hide the host galaxy," says Knud Jahnke, who led the observations performed at the VLT. "However, we did not find any. Instead we discovered that an apparently unrelated galaxy in the quasar's immediate neighbourhood is producing stars at a frantic rate." Colour composite image of a peculiar object, the nearby quasar HE0450-2958, which is the only one for which no sign of a host galaxy has yet been detected. A team of astronomers has identified black hole jets as a possible driver of galaxy formation, which may also represent the long-sought missing link to understanding why the mass of black holes is larger in galaxies that contain more stars. The mid-infrared part of this image was obtained with the VISIR instrument on ESO’s Very Large Telescope, while the visible image comes courtesy of the Hubble Space Telescope and the Advanced Camera for Surveys. "The two objects are bound to merge in the future: the quasar is moving at a speed of only a few tens of thousands of km/h with respect to the companion galaxy and their separation is only about 22 000 light-years," says Elbaz. "Although the quasar is still 'naked', it will eventually be 'dressed' when it merges with its star-rich companion. It will then finally reside inside a host galaxy like all other quasars." Hence, the team have identified black hole jets as a possible driver of galaxy formation, which may also represent the long-sought missing link to understanding why the mass of black holes is larger in galaxies that contain more stars. "A natural extension of our work is to search for similar objects in other systems," says Jahnke. Future instruments, such as the Atacama Large Millimeter/submillimeter Array, the European Extremely Large Telescope and the NASA/ESA/CSA James Webb Space Telescope will be able to search for such objects at even larger distances from us, probing the connection between black holes and the formation of galaxies in the more distant Universe. Only in the past few years have observations of this system been able to refute the earlier hypothesis that its supermassive black hole was gravitationally kicked out of the parent galaxy. A good summary of past observations of HE 0450-2958 can be found here: http://en.wikiped...450-2958 . The two papers referenced here offer some additional proof that the quasar does indeed have some type of host galaxy not directly associated with the jet or the companion galaxy. Took ya'll long enough to come up with a decent idea. Its pretty obvious that the center of gallaxys grow outwards. "Black holes" (really massive neutron stars) may “build” their own host galaxy by neutron emission and neutron decay. Actually two papers reporting the results of new observations are available . Links to both papers and some additional info about the research may be found here: http://www.mpia.d...Projects (Btw, the illustration used here is not the best available, see the site linked above or in the two papers recently published, for better, labeled images of HE 0450-2958). The most recent of the two ("Quasar Induced Star Formation: A New Paradigm" by Elbaz et. al.) goes into more detail concerning this new theory. Mention is made of a few other systems that possibly exhibit jet induced star formation ( Minkowski's Object in Abell 194 and 3C 321, among others). Jet induced star formation has also been observed in Cen A, so this mode of star formation is now well documented. Some material must be present to feed the SMBH, otherwise the QSO would cease to shine, And this is exactly what the new observations have shown. 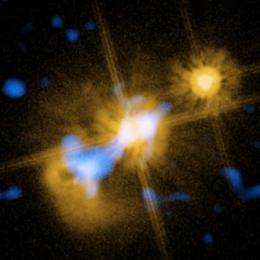 After digitally subtracting the bright light from the OSO, faint wisps of dust and gas are seen surrounding the quasar. The eventual merger of the companion galaxy should supply copious amounts of fuel to the quasar (and at the same time, actually blowing back some of this fuel and quenching star birth in the quasars home galaxy[ aka feedback]). From radiation geometry of white hole follows, young quasars are shinning over whole their surface like so-called "naked singularities" or "white holes". Just after excessive mass is evaporated, the event horizon is formed and originally formed spherical "dust galaxy" is changing into its common flat shape. It seems, the mechanism of matter formation and evaporation into radiation is completely reversible at sufficiently large scales: galaxies are forming from dark matter clouds and evaporating again like giant density fluctuations of gas or like quantum wave packets. ... rather than coalescing, it seems appropriate to spend time studying repulsive nuclear forces that might explain these astronomical observations. Do you have some evidence for your claim? In AWT both these phenomena should remain completely symmetrical. The effect of gravity should balance the effect of radiation pressure at largest scale.